The revenue of China’s automotive sector in Q3 2018 dropped by 10.3% y/y to RMB 1,895.1bn, mainly due to declined sales of automobiles. In Q3 2018, automotive sales fell by 6.5% y/y to 6.4mn units following the slowdown of the Chinese economy and the cancellation of some preferential policies on vehicle purchase. A total of 5.5mn passenger cars were sold in Q3 2018, down by 7% y/y. In particular, the sales volume of MPVs during this period decreased by 13.8% y/y to 379,453 units. Commercial car sales in Q3 2018 slid by 3.4% y/y to 939,733 units. The sales of buses declined by 12.3% y/y to 98,896 units. The production of automobiles in Q3 2018 reached 6.4mn units, down by 5.7% y/y, due to increased inventory and imports. The output of passenger cars and commercial cars in Q3 2018 was down by 6% and 4.2% y/y to 5.5mn units and 936,628 units, respectively. 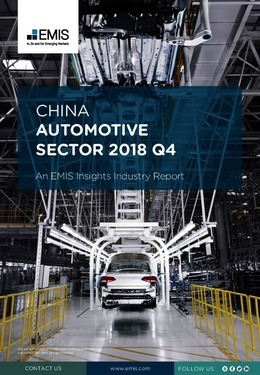 This report provides a complete and detailed analysis of the automotive sector for China. EMIS Insights presents in-depth business intelligence in a standard format across countries and regions, providing a balanced mix between analysis and data.